Nose: A bit reluctant on the nose at first with vanilla and alcohol. By and by subtle fruity flavours of apricots and apples arrive, mixed with notes of autumn leaves and oak in the back. Palate: Bold and intense on the palate with loads of spices - pepper, even chilli and slightly astringent oak. Once this strong warmth fades, a filigree sweetness of apples, apricot jam and hints of bananas arrives, followed by a herbal touch and some bitter notes of grape peel towards the finish. Finish: The finish is long and tender sweet with acacia honey. The oak becomes very dry on the tail accompanied by cocoa and some astringent tannins. With water: There's clearly more fruitiness on the nose with water. Mellow vanilla and less alcohol. 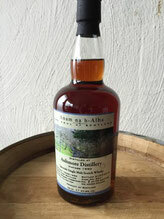 Lovely sweet and fruity on the palate with apricots and peaches, followed by a tamed warming spiciness of pepper and oak. The finish is a bit shorter and slightly warming with an increased dryness of oak and bitter grape peel. Comments: An unconvincing dram to me. Quite shy on the nose, very spicy and simply straight forward on the palate, and too much of bitterness on the finish. 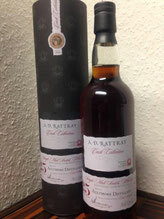 Water brings out some delicate fruitiness, decreases the massive alcohol load but also emphasises the bitter character of this Speyside whisky. This dram lacks some complexity and sweetness at least to my palate. Nose: A massive load of sherry! Deep and rich with sticky toffee, and heavy dark fruit - raisins, prunes and dates. Thick treacle with burnt sugar and pleasant flavours of Christmas cake. A whiff of burnt matches emerges with a gentle touch of citrus and grape skins. Very complex. Palate: Multiple layers of dark fruit, sultanas, raisins and sticky plum jam intermingle with slightly bitter notes of orange peel, marzipan and a wee touch of sulphur. Warm and intense. Spiced oak, pepper and dark chocolate linger towards the slightly dry finish. Finish: A medium to long finish with sticky honey and mouth-watering orange peel. Slightly bitter notes of tannic oak and spice on the tail. With water: A bit fresher on the nose by adding a splash of water with big notes of sherry and stewed dark fruit. Sweet and fruity with nicely prickling oak on the midpalate. The finish, however, is short and dry. Comments: This is a rich and mature whisky from an incredibly intense sherry cask. Full of "dark" flavours, perfectly harmonized and well balanced. A big dram to sip and savour in front of an open fire. A must have for the sherry aficionado. I thank Jan Thaler for the photograph! Nose: Deep and rich with a big sherried hit. There's heavy dark fruit, plums and raisins, complemented by subtle sulphur. Sweet flavours with dark rum and chocolate emerge, along with a touch of luscious Seville orange. Behind that winterly spices occur with a lingering nuttiness and a touch of earthy tones. Palate: Sweet and thick with lots of sherry, heavy dark fruit, and sticky plum marmalade, immediately followed by a huge amount of walnuts, oak spice and lingering tannins. Sticks on the tongue for hours while warming your throat. Bold, rich and intense, rounded and well-balanced with a whiff of earthy tones. Mouth-coating. Finish: A medium to long, sweet, warm and spiced finish. Gets drier in the end with delicate walnut flavours, a touch of pleasant sulphurous tones and subtle earthy notes. With water: There's not much change on the pleasant nose with signficantly more crispy spice on the palate, along with delicate walnuts and a hint of sulphur again. The finish is medium to long with delicate sweetness and warm spice. Comments: This is a mature, perfectly harmonized, and balanced whisky. Very rich with both sweet and spicy/earthy notes. A big dram to sip and savour. Another big hit for the sherry aficionado. Well done! I thank Tom Skowronek (owner of Anam na h-Alba / The Soul of Scotland) for the photograph!